Would this be a good enough pump to use on 04 Forester XT with 850cc injectors and a Blouch TD05 18G turbo? Or would the DW300 be better? A: It will depend on what fuel you want to use. This pump should work fine if you plan on using pump gas. The larger DW300 would be better for E85 applications. I have an 06 sti with the cobb v3 could I run this pump to get some extra power? 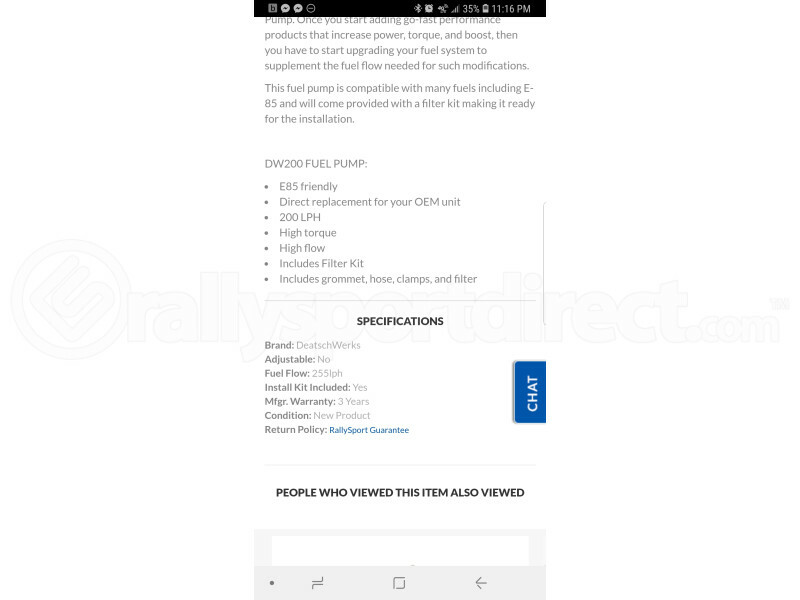 A: A fuel pump does not add power, a fuel pump will allow you to run more power safely but it is not required at Stage 2.
would this fuel pump be able to support DW 1000cc injectors and a gt3582r .62a/ror ould he dw300 be a better set up? A: This pump is generally able to support the 1000cc injectors but if you are looking to run a more demanding fuel like E85 you may have to go larger for both injector and pump. A: A tune is not necessary when installing a fuel pump and a tune will not give you any advantages with a fuel pump alone. will this fuel pump work as a good replacement for a stock pump from a stock 99 2.5RS? A: This will work well as a stock replacement for a 1999 2.5RS. I am currently running this pump and i am about to upgrade to the tomei m7960 turbo with 1000cc injectors, will this pump be able to handle the flow needed? A: As long as you dont run those injectors over 85-90% IDC it should be no problem. Along with not changing the factory fuel pressure. does this pump kit also come with a fuel level sensor? if not, would i be able to add one to my order? A: This is just the replacement pump and does not replace any additional components. If you need a fuel level switch, that would be a dealership only type of item. What is the rate of flow for this vs. The dw300? A: The DW200 is rated at 255lph and the DW300 is 320lph. Will this fuel pump give me better MPG than the stock one? Im planning on replacing it anyways because im not sure when the last time it was. But I know i only get at least 200 miles on one tank. A: A fuel pump will not effect your fuel economy as that is controlled by the ECU, injectors, and your driving style. If your fuel economy has decreased for no reason you will need to do some diagnostics to see what could be causing it. I was told by a tech on here to get the DW200 above all other pumps. If Zach G says it wont give 1000cc inj their full load why would I have it recommended to me. I see the fuel rate is still 255lph. Am I going to need something bigger or is this going to be sufficient? A: On a Subaru application we have seen these size of pumps be able to run between 350-450WHP. Do to a infinite number of variables its impossible to tell if this pump will be able to supply your power demands with out really knowing what IDC, FP, pump DC, and fuel system your running. If your running 1000cc injectors, and are planning on running them to their limits maybe consider the DW300 pump do to its larger flow capacity. However this is a very capable pump, so if you do some simple calculations you or your tuner should be able to figure out the fuel demand your set up will need to match a proper pump. A: This pump is fully E85, Pump and race fuel compatible! In my 04 WRX will this give my Deatschwerks 1000cc injectors thier full load? A: This pump will support 1000cc injectors, but not to their full flow potential.